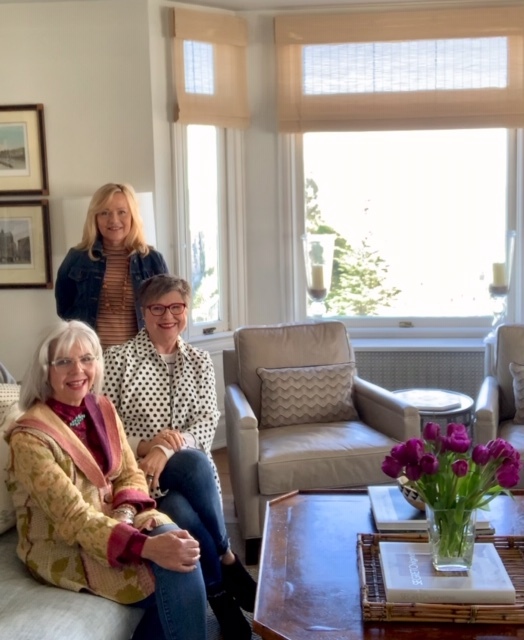 I flipped out when Cindy Hattersley walked through the door for a blogging buddy working lunch at Mary Ann Pickett’s beautiful apartment atop Russian Hill overlooking the Golden Gate Bridge. It took me about two minutes before I zoomed in for a closer look and started asking questions. Cindy is an interior designer. 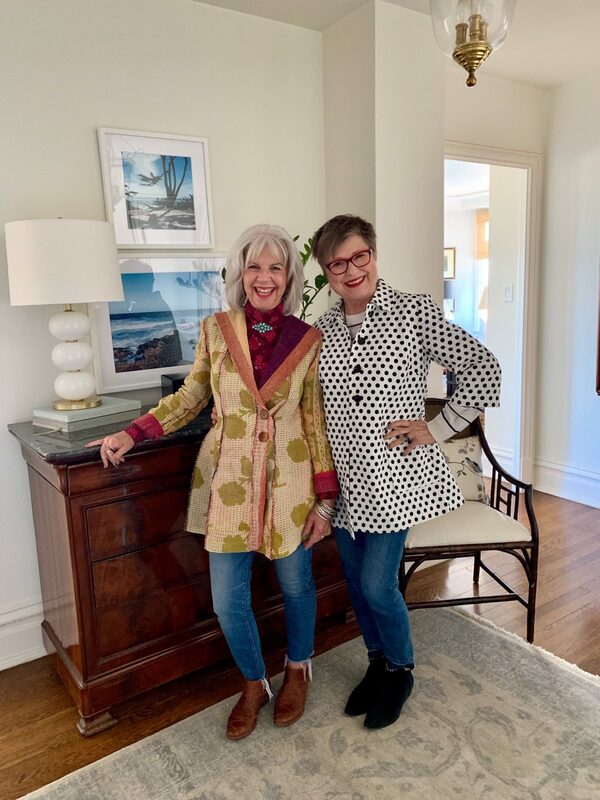 I’m sure she can’t help but use some of her interior design principles to put her outfits together, but when I spoke with her about the pieces she was wearing, it was mostly about love—wearing what she loves—which is something we can all do. Here are the things I noticed right away about Cindy’s outfit. 1. I loved her American Indian turquoise brooch. What a spectacular focal point. That turquoise color against the berry and hot pink colors in her shirt was a wow. Red and green are opposite each other on the color wheel. When you combine colors that are opposite each other on the color wheel (in this case, variations of red and green) they manage to each bring bold attention to each other. I love how she popped her collar up as it brings even more drama to the piece of jewelry. She purchased this pin in Santa Fe years ago. 2. In this next image, you can see what happens next. She grabs our attention with her pin and the pin leads us right to her earrings. Also from a trip to Santa Fe, the earrings are by artist Don Lucas. We’ve got an accessory party going on. 3. Can we say Beauty Bundle, everyone? Take a look at her bracelets. When I study an outfit I ask myself what’s holding it together? In this case, her earrings, prominent pin, and an array of bangles are all sharing the same story. They create an impact and I’m drawn in to notice even more of her outfit. 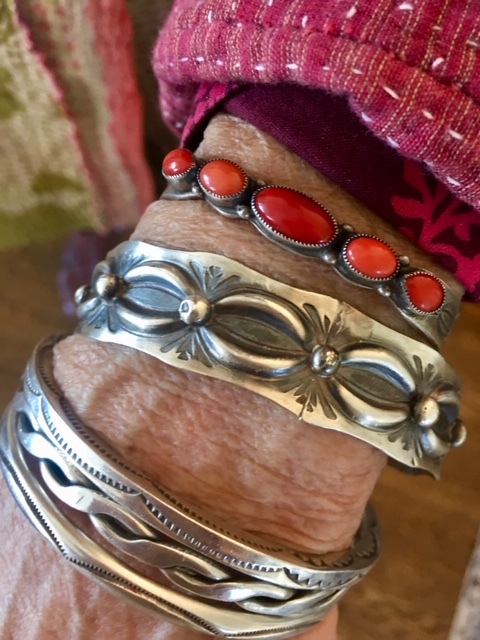 These American Indian bangles are longtime treasures from her collection. 4. The mixed prints of her shirt and jacket are so spunky together. I’m happy that the most dynamic part is the V-shape created by her shirt. Why? Because it grabs our attention first and leads us right to her face. (I’m repeating this image so you don’t have to scroll up.) 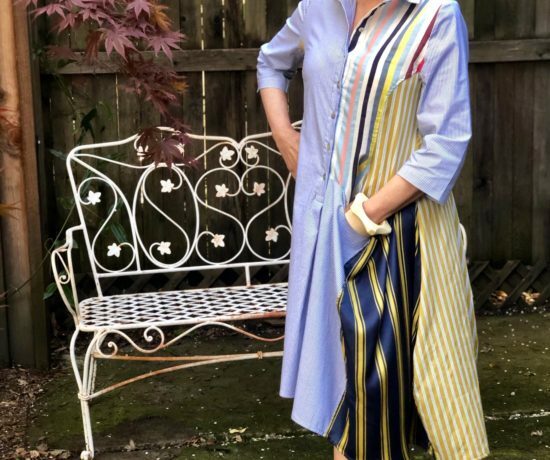 Her cotton shirt is about three years old and came from J.Crew. 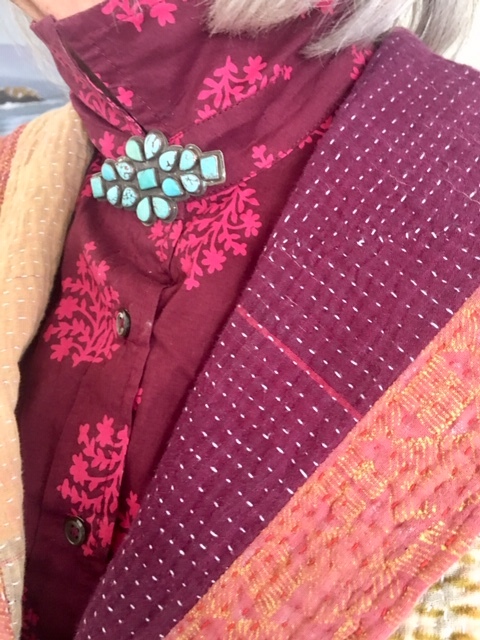 Next, we move out to enjoy the more quiet and subtle colors and prints in her jacket. Isn’t that a fabulous segue? She bought the jacket from Etsy and she likes that it looks fairly worn. 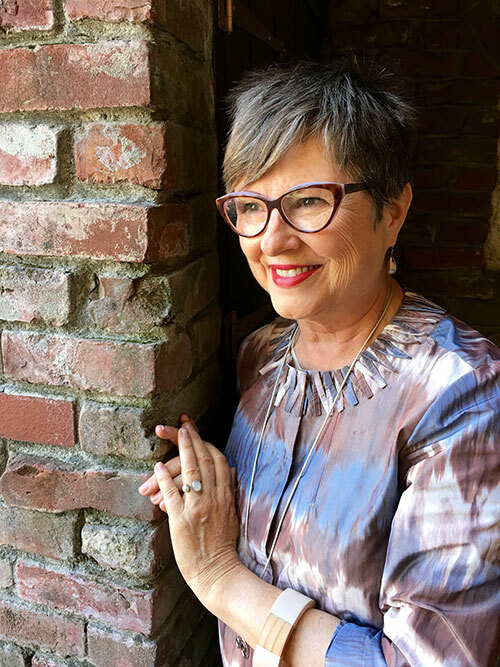 You’re not going to be surprised to find out that she loves antiques, are you? The topstitching on the jacket gives great surface interest. It’s pretty hard right now to be sitting in my computer chair tapping away because I want to be jumping up and down giving this outfit a standing ovation! 5. 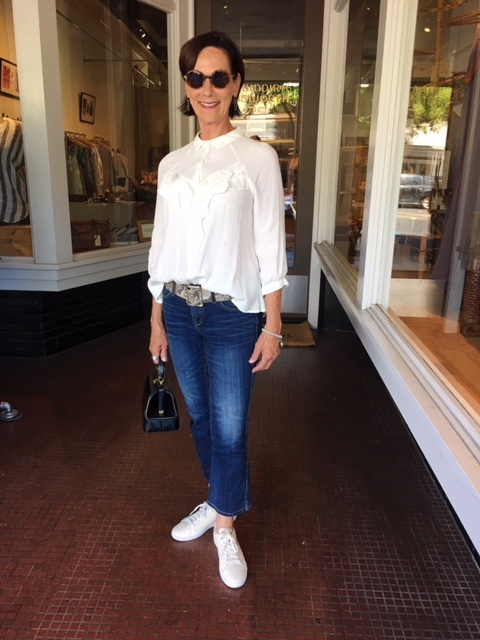 What’s a casual chic outfit without jeans? These are her new favorites and they’re by Madewell. The frayed hem edge is a modern touch and the fit is perfect on Cindy. 6. Her booties have that worn-in look as well. The woven leather gives her outfit more textural interest. 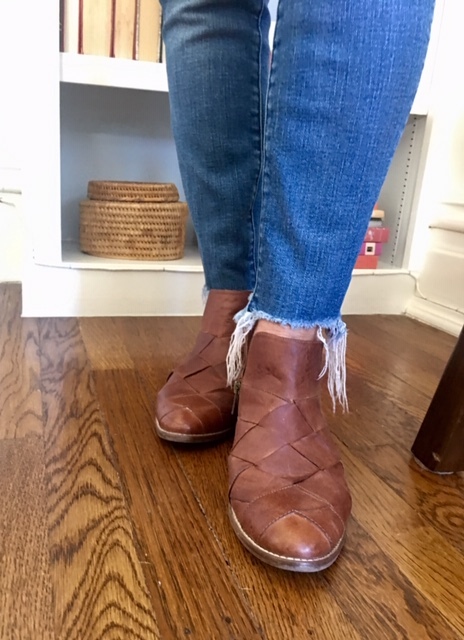 These Seychelles booties also provide a fashion solution for Cindy. She has a bunion on her left foot and the wide toe box makes that a non-issue. 7. I also want you to know about her lipstick color. It’s by Chanel and is called Sensual Rose. It’s only a perfect choice with her outfit. From head-to-toe, she’s nailed the casual chic look. The well put together outfit tells me she’s creative, sensitive, reflective and approachable. If she was standing in line ahead of you waiting to pay for her purchases, you’d be talking to her. You’d probably tell her what a great outfit she’s wearing and in thirty-seconds, you’d be in a full on conversation with her. I just know it. 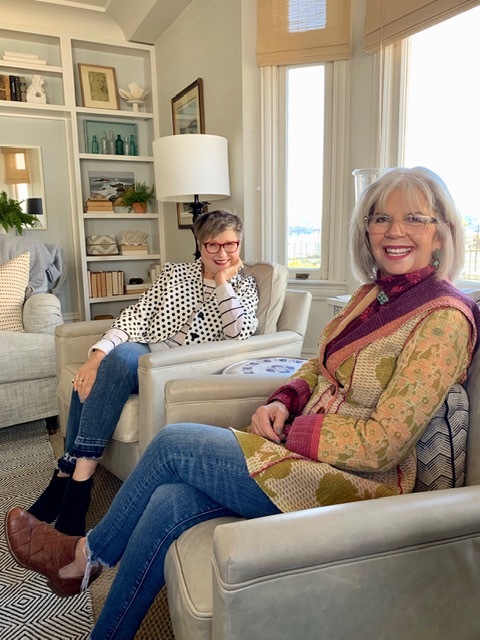 Here are ways to learn about Cindy and about Mary Ann Pickett who’s apartment we’re in and who is also an interior designer. Here’s Cindy’s website Cindy Hattersley Design. See more pics of Mary Ann’s design sense and her lovely apartment on her blog Classic Casual Home. I hope you’ve enjoyed this anatomy of Cindy’s outfit. Is there a detail I missed? What’s your favorite formula for casual chic style? Are you wearing what you love? Can’t wait to hear about some of your style secrets! What I love most is that smile which tells you she is comfortable and confident in her skin and her clothes. Thank you for breaking down her outfit. Isn’t it contagious!! So happy you “caught” that! She’s divine! Goals. Everything I see and read in this are life goals. That’s so cool, Kathysue!! She’s a gem, I’ll say that!!! They both are! So happy to have met them! I love this outfit and would wear it whole cloth! I’m off to do a little digging to see if I can find similar pieces! It looks you all had a wonderful time. We always do although I feel like the dumb little sister most often when we get into blog talk, all the technical parts. I admire the two of them so very, very much! I love BOTH of your outfits! The analysis of Cindy’s outfit was very educational, and inspiring. I would have instinctively loved her ensemble, but this gives some food for thought as we plan our own outfits. Oddly, I woke up thinking I am in a bit of a style rut myself, though I consistently manage to dress myself with some flair. I seem to have put myself on a rather strict diet of not purchasing almost any new clothes or shoes since the new year, except one beautiful skirt. Also, I have stopped making msyelf new handknits–it feels like I have so many that why would I make myself anymore, for now! (Instead I have been making things for my granddaughter-to-be.) 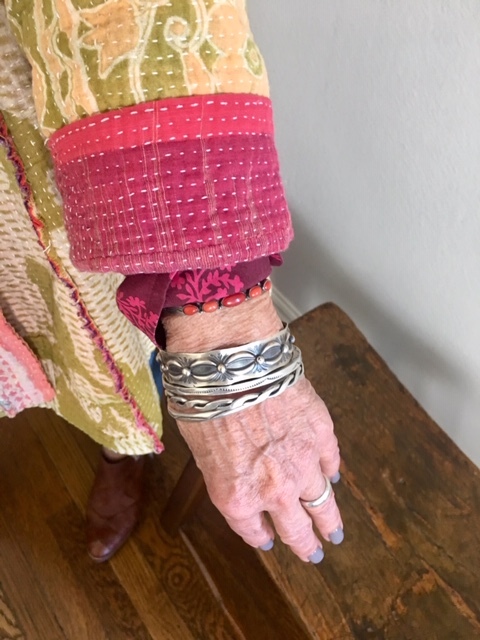 I recombine elements of my “collection” (as I like to think of it) in new ways, but there is no spark in my soul most days for the art of dressing. This is unusual! I feel good about consuming less, for sure, but perhaps I have gone too far with my “diet”. . . I love your discussion! And maybe you’re right about the diet you’ve been on. Last weekend I bought two little scarves and I felt so happy about my purchases. Those have been my spring purchases other than the shoes I bought for Caitlin’s shower and the gala at the conference I just got back from. Those little things delight me like crazy. I think if we have the blahs, it’s okay to shop for something that sparks our love. Can’t wait to continue hearing about your journey! GOTTA LOVE CINDY NO MATTER WHAT SHE IS WEARING!SHE IS FROM INDIANA MY MOTHERS HOME STATE! 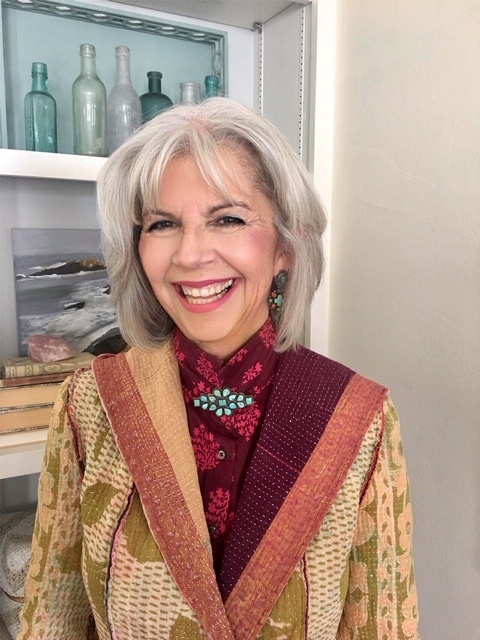 THAT WOMAN GETS AROUND……..shopping on ETSY and going to Santa Fe!PLUS SHE WORKS FULL TIME AND DOES HER BLOGGY!SHE HAS A GREAT LOOK AND CAME UP WITH OUR AGELESS STYLE POSTS ONCE A MONTH!THE WOMAN NEVER SLEEPS!!!!! !SHE IS CONSTANT MOTION and LOOKS GRAND DOING IT! Miss Vintage Contessa, I wholeheartedly agree!!! She’s a marvel! I wish I had half her brain. I love Cindy’s outfit. I don’t have any brooches as they are something I haven’t collected. I would probably not buy the unhemmed jeans as I doubt they will be in style every long. It all looks so good on her and if I ran into her, I would probably ask her where she got her jacket. Thanks for the style lesson. Cindy buys things from eBay and Etsy and small boutiques. I have never purchased anything from eBay or Etsy but she’s giving me reasons to check out those sources! Laurel, I’d seen that brand before but when Cindy said it had a wide toe box, I thought I better check them more closely. More and more a wide toe box feels good to me. I don’t have bunions but my toes like room to wiggle around! Marvelous, Marge! I love hearing things like this. Cindy has it all going on and she’s a great teacher! I learned a lot from her outfit, too. You both look amazing. I know I need to step out of my style box and try new things. I’m not as brave as Cindy but totally admire her look. Your apparel is a tad more me ;-). 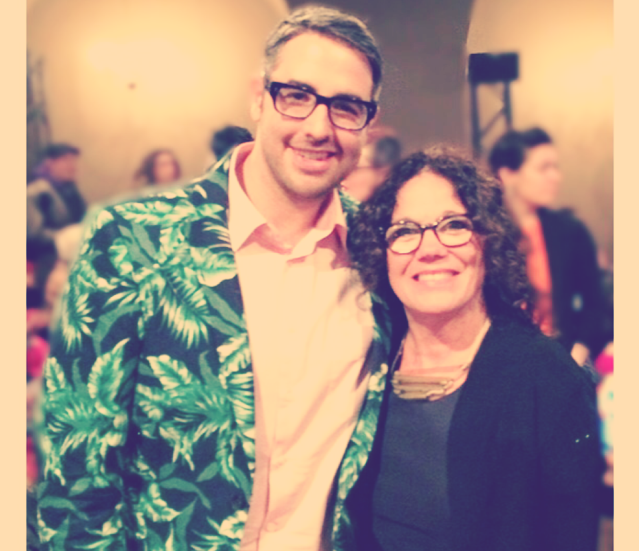 That’s the wonderful thing about personal style–it evolves and changes over time. We still have time to try new things, Miss June 21st!! 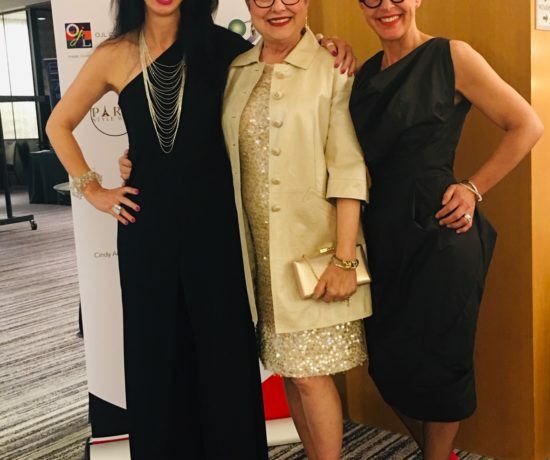 Love this style post, and love you three ladies! Cindy looks great in Boho style; sadly, I don’t wear it well. Can’t wait to hear about the arrival of your grand baby! Oh, Karen, I can’t wait for that little girl to arrive. It won’t be long now! All my wonderings about what it would be like to be a grandmother will soon be a reality, not just daydreams. Oh my goodness I am “gobstruck” as Debra would say. I am so honored that you approve. I know I always have to step up my game when Brenda comes to town! This is so sweet really Brenda. I feel so lucky that we all found each other through blogging. The jacket is from an Etsy shop called Fairly Worn. 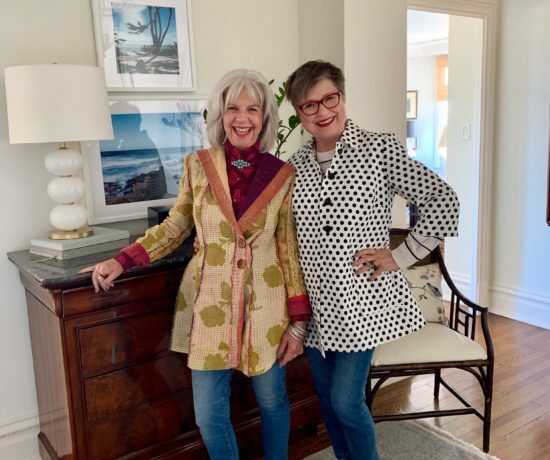 Mieko Mintz for Artful Home does similar jackets that I also love. I should have added that I often buy clothes on Ebay, Etsy, and small boutiques. I shop for clothes the way I shop for interiors. I like a collected look that is gathered over time. Cindy, you must be prepared that every time I see you I’ll be writing about you! Your style is so great. And I really like what you added here at the end about liking a collected look. I see that so much in your interiors and hadn’t thought about it as a fashion intention. See? I keep learning things from you! It was so fun to write about you and your outfit. Thanks for not cringing when I asked if I could! Big hugs to you! Kathy, I do think it’s time to rethink! Cindy is so inspiring. I’d encourage you to enjoy that style again! Did she start assembling her outfit with the accessories, or did she add them at the end? I really don’t know! Great question! I just adore Cindy and in person she is even more chic and so gracious. I love how she pulls her look together- always it seems with special details. Such a great photo of her smiling here- so pretty! She has fantastic taste, but is very humble about it! I am just getting acquainted with your blog Brenda. What a fun series. Thanks, Kim, glad you’re enjoying the blog. You said something so true about Cindy, how she’s so humble about her style. She’s the best!